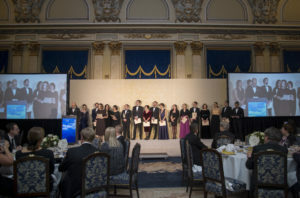 Already a treasured tradition, the Aspen Institute Romania Leadership Awards and Gala Dinner represents the opportunity for the thriving and growing Aspen community to reunite and revisit its shared values and interests. A pleasant night among friends, a celebration of values-based leadership, innovation and excellence, the event aims to allow all of our guests a moment of reflection on what is the added value of our community. The AIR founders and team were tenacious enough to establish, build and carefully support through the years the embodiment of the Aspen Idea in Romania. The Aspen Gala offers to the Aspen Young Leaders, Aspen Fellows and Alumni the opportunity to present their accomplishments from the past year and to reaffirm their ambition of producing a significant impact on societies across Central and Eastern Europe. At the same time, through the Aspen Leadership Awards we acknowledge specific efforts and personal commitment to values-based, creative and transformative leadership of people that have had a significant contribution to the over-all advancement of society. The Aspen Gala is a fundraising event for which we invite each year our community, partners and friends to join us as sponsors and the proceeds go to the Aspen Leadership Trust in order to support our Leadership Initiatives. With the help of the generous contributions of our sponsors, we are able to offer each year scholarships for public sector and NGO representatives to attend the Aspen Seminar for Leaders, to organize the Aspen Junior Seminar (program attended by students and young professionals aged 20 to 24) and also the scholarship based Young Leaders Program. Moreover, the continued commitment of our partners to our activities enables us to provide recognition to a social project developed by an Aspen fellow or alumnus/a, to be chosen by the vote of the Aspen Community and presented at the Gala. The Values Based Leadership Award is presented to a public leader or national organization that has excelled in his field of activity, by constantly supporting and promoting national and universal values. Ambassador Sorin Ducaru took over the post of Assistant Secretary General for Emerging Security Challenges in 1September 2013. He is responsible for providing support to the North-Atlantic Council and for advising the Secretary General on the evolution of emerging security challenges and their potential impact on NATO’s security. Prior to his appointment as ASG, Ambassador Ducaru served as Romania’s Permanent Representative to the North Atlantic Council, from September 2006 to September 2013. From November 2011, Ambassador Ducaru was the Dean of the North Atlantic Council. Ambassador Ducaru was born on 22 June 1964, in Baia-Mare, Romania. He graduated from the Polytechnic Institute of Bucharest in 1988 and the Romanian National School of Political Studies and Public Administration in 1992. He holds a MPhil Degree in International Relations from the University of Amsterdam (1993) and a PhD degree in International Economics from the Academy of Economic Studies in Bucharest (2005). He joined the Romanian Ministry of Foreign Affairs in 1993, assuming various posts such as member of the Policy Planning team, counsellor to the Minister, spokesman of the MFA and Director for NATO and Strategic Issues. From 2001 to 2006, he served as Romania’s Ambassador to the United States of America. In 2000–2001, Ambassador Ducaru served as Permanent Representative of Romania to the United Nations, in New York. In the year 2000 Ambassador Ducaru was awarded by the President of Romania the National Order of “Faithful Service” in rank of Commander, followed by, in 2006 the Order for “Diplomatic Merit” and in 2008 the rank of Knight of the National Order “The Star of Romania”. He received the title of “Ambassador of the Year” in 2003 and 2012, from the Minister of Foreign Affairs of Romania. The Service with Dignity Leadership Award is presented to a Romanian public servant that has proven constant effort to exemplary fulfill work duties and go beyond those, as a role model for the community. By their impeccable professional and ethical standards those nominated for this award are seen as guardians of the Good Society, leaders among their peers, and as a source of pride and inspiration. The Romanian Invictus Team is comprised of 15 members of the Romanian armed services personnel, all of whom have been severely injured in Iraq and Afghanistan. The members and staff of the entire Romanian Invictus Team which participated in this year’s edition of the Invictus Games, held in Toronto, Canada, has showed great and inspiring commitment, and they have successfully and with a special sense of dignity and pride represented Romania. This is Romania’s first time competing in the Invictus Games. Not only did they return with well-deserved medals, entirely the result of their acerbic work, but their humble, fraternal and dedicated collective stance in front of serious adversity offers us a model. Together, the sportsmen, their trainers, the support team, and their friends and families stand for something higher. The Romanian Invictus Team’s extraordinary effort and commitment resulted in winning multiple medals in the Invictus Games competitions. Team Romania (Ionuț Butoi, Dorin Petruț, and Nicușor Pegulescu) has won the gold medal in the men’s team open compound archery event, while Ionuț Butoi has also won the silver medal in the men’s open compound – final gold archery event. Laurențiu Șerban won Romania’s first-ever Invictus Games medal. During a mission in 2006 in Afghanistan, Laurențiu Șerban has lost his leg trying to evacuate injured colleagues from a military vehicle that had been attacked by an improvised explosive device. The team captain won bronze in the men’s IT1 1,500-metre run with a time of 5:41.71 and also placed 4th, 5th and 6th in another three different compounds. Lieutenant Ciprian Iriciuc, who was wounded during a mission in Afghanistan two years ago, won the second medal for Romania at the 2017 Invictus Games. He got the bronze medal in the Indoor Rowing competition. Sergeant major Dumitru Paraschiva finished fifth in the same contest. Overall, the majority of the Romanian Invictus Team members were in the first half of the ranking. Their accomplishments are entirely theirs, but we all humbly enjoy the perks of their remarkable results. Therefore, we respect the sacrifice and salute the commitment and achievements of the entire Romanian Invictus Team. The 2017 Service with Dignity Leadership Award is presented by Mr. Vasile Iuga and Ms. Cătălina Iuga. Ionela-Livia Lehaci and Gianina-Elena Beleagă are two Romanian rowers, both born in 1995 in the north side of the country. They only teamed up in 2015 and since then they are competing for the Lightweight Women’s Double Team category. In 2016 they qualified to the Rio Olympics, but their results were below par. In 2017 they had a poor start, ranking 4th in the European Rowing Championships hosted by Racice. Then they performed in the under-23 European Championships in Bulgaria, where they won gold. Earlier this year they also won the women’s double-scull race at the under-23 European Rowing Championships in Warsaw. Finally, at the World Rowing Championships held recently at Sarasota-Bradenton, US, the Romanian team made up of Lehaci and Beleagă grabbed the gold medal in the Lightweight Women’s Double Sculls race. Although they started in the third position, the Romanians made a formidable race and passed the finish line first – that was a surprise for almost everybody, especially considering that Romania had not won the first world title to this category for almost 15 years, category which had strong tradition for Romania and brought many Olympic medals in the past. Lehaci and Beleagă are the perfect example for the golden relationship that can be linked between two athletes coming from rival clubs (Steaua and Dinamo). The way they teamed up shows us that membership in a club is just an entry on the sports card and that what is really important is their desire to win the gold medal for Romania. Their next challenge is to win the gold medal at Tokio 2020 Olympic Games. Ionela and Gianina have built a strong team under the Romanian flag, a team which is always goal-oriented and driven by the leadership skills they both exhibit. Behind their accomplishments, there a story of determination, dedication and ambition of these two young girls to whom no one give them chance in the past to dream that big. The 2017 Sports and Society Leadership Award is presented by Raiffeisen Bank. Cosmin Negrescu is the Founder & CEO of SEOmonitor.com, an award-winning software product that brings a new and improved way of measuring and predicting SEO performance. The product was awarded with the Best Software Innovation award at the 2016 European Search Awards. Developed and managed solely from Romania, SEOmonitor acquired clients in 35 countries and has been adopted by global brands like Uber, BBC, TUI, Shopify, Raiffeisen Bank and an Amazon company. Prior to SEOmonitor, Cosmin Negrescu founded and managed the leading SEO agency in Romania, upswing.ro, which also organized SEM Days, a key event for the local search industry. Cosmin Negrescu is a young and ambitious entrepreneur, innovating in all areas of SEO, digital marketing and e-commerce. He is also involved in mentoring other tech startups, like baro.io, and a recurring speaker at digital marketing events worldwide. The 2017 Innovation and Technology Leadership Award is presented by ExxonMobil Romania. Mircea Cantor makes films and sculptural installations that often elaborate on uncertainty, countering prevailing notions that everything can be known or predicted. He aroused international attention in the early 2000s with works, such as, The Landscape Is Changing (2003), a film depicting demonstrators carrying large mirrors instead of slogans as they walked through the streets of Tirana, and Departure (2005), a film that chronicles the encounter between a wolf and a deer inside an empty gallery space. Cantor’s work, which regularly offers subtle critiques on the architecture of power, is equally centered on unveiling methods of empirical engagement with objects and images through a sustained long-term examination. More recently Cantor has taken up the question of craftsmanship and tradition relating the “intuitive” energy that tests how different fields of knowledge might make sense of human creation and the multiplicity of perspectives that inform our understanding of our relationship to time, consciousness, and experience. His activity includes also editorial practice, curating, graphic design, corporate identity logo and branding and posters. Lately he was doing the scenography for The Little Prince directed by Alexandru Dabija at Teatrul de Comedie, Bucarest (2017). He was awarded in 2011 the Prix Marcel Duchamp Award; in 2010 Zece pentru Romania Award by Realitatea TV; in 2008 he was nominated for Artes Mundi Prize 3rd edition, Wales, UK; in 2004 he was awarded The Prix Fondation d’entreprise Ricard. His works are included in world-wide prestigious public collections such as Centre Pompidou, Paris (France); Museum of Modern Art, New York (USA); Museum Abteiberg, Monchengladbach (Germany); Museo Nacional Centro de Arte Reina Sofia, Madrid (Spain); Magasin 3, Stockholm (Sweden); Kunsthaus Zurich, Zürich (Switzerland); Philadelphia Museum of Art, Philadelphia (USA); Hirshhorn Museum, Washington D.C (USA); Fondation François Pinault, Paris (France); Walker Art Center, Minneapolis (USA); Fondation Lois Vuitton, Paris (France). His upcoming solo show will be open at Fondation Hermes, Tokyo in April 2018. He is represented by VNH Gallery in Paris; Dvir Gallery in Tel Aviv/ Bruxelles and Magazzino Gallery in Rome. The 2017 Arts and Society Leadership Award Leadership Award is presented by UniCredit Bank. The Forum was intended to highlight Constanta’s potential of turning into an engine of growth on Romania’s Eastern flank.